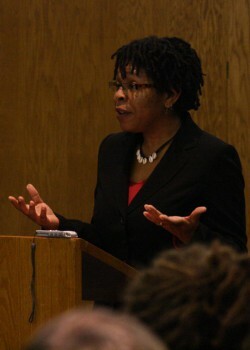 Regina Shands-Stoltzfus presented her doctoral research on African American Mennonite women in a lecture in NC-17, Tuesday. Photo by Martin Brubaker. These words have guided the doctoral research of Regina Shands Stoltzfus, Assistant Professor of Peace, justice and conflict studies, who presented her research in a public lecture Tuesday night entitled, “’As Purple is to Lavender’: Experience and Influence of African-American Women in North American Mennonite Affiliated Churches, 1948-1968.” She is pursuing her doctoral research at Chicago Theological Seminary. The Mennonite Historical Society sponsored the Tuesday-night affair in which professors, students and community members learned about Shands Stoltzfus’ research concerning the role of African-American women in the Mennonite Church before and during the Civil Rights Movement. Shands Stoltzfus interviewed seven Mennonite African-American women and expressed her desire to “capture these stories, hold them, and share them with the church.” African-Americans desired freedom, social change and equality during the Civil Rights Movement. Mennonites’ eagerness to create integrated churches and the respect that stemmed from “leaders who lived and breathed what we did” invited African-American families to the Mennonite faith tradition. The women she interviewed were born in the northern U.S. and claimed other faith traditions prior to becoming Mennonite. They attended three different Mennonite churches in the midwest. Shands Stoltzfus described the life of her grandmother, Joyce, who lived in Cleveland among a large black community. Ample factory jobs drew African-Americans to the area. “There were a lot of black people with things to do,” said Shands Stoltzfus. The close-knit community that Joyce lived in included Lee Heights Mennonite Church. The church’s close distance to Joyce’s home led her there. The welcoming Christian environment convinced Joyce to convert from Baptist to Mennonite; however, she missed the call-and-response and gospel music that have been incorporated into contemporary Mennonite churches. Through the little-known stories of Mennonite African-American women such as Joyce, Shands Stoltzfus shaped and continues to shape her own narrative.